The nutritional needs of residents are multi-faceted and are an important factor in maintaining a happy and healthy life here at The Home. Our Registered Dietitian Nutritionist develops a nutrition care plan for each resident’s medical condition, personal preferences, and needs. We closely monitor and evaluate each person’s ability to chew and swallow, self-feed, and watch for weight loss or gain. 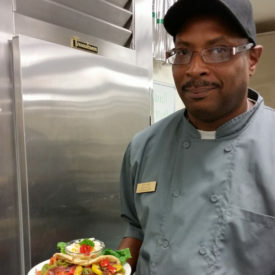 Led by an executive chef, the kitchen staff caters to the individual needs of the residents, offering daily dining choices that appeal to a wide variety of tastes, appetites, and diets. Choice of food can have a tremendous impact on one’s life, and a healthy lifestyle begins with a healthy diet. 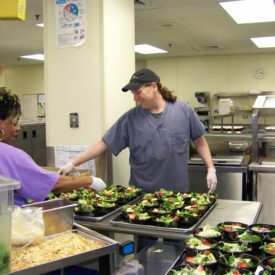 Our menu offers a blend of home cooking, seasonal and specialty meals.